'Found one!' says it all (Photo. 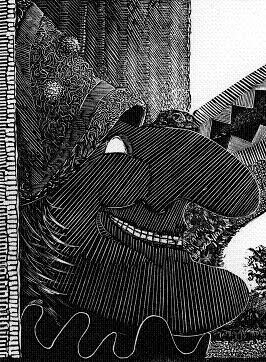 Bill Mudge). Thank you Brighton for making us all so welcome. We had a fantastic day and all the magnets got picked up. 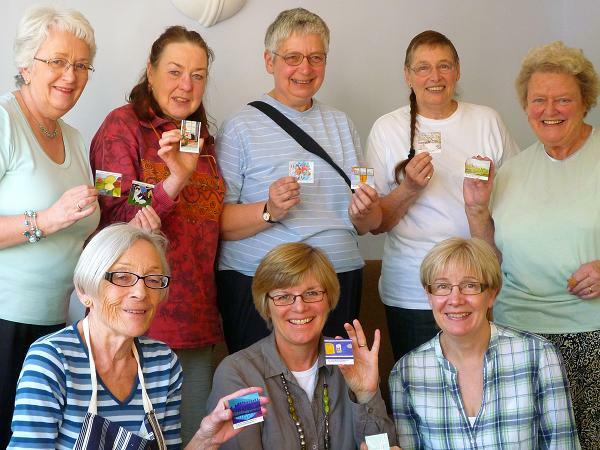 If you've picked up a magnet and want to know who made it, Click on the slideshow or link on the right. Just match the numbers. If you'd like to send a comment to the artist. Then send me an email with the magnets number and what you want to say and we'll post it on the 'Collector's Comment' page. openfridge@googlemail.com is our address. If you missed the exhibition we've some photos on the 'Event 2011' page or view the slideshow. If you've never done this before and want to get involved in our next exhibition then send me an email. Its FREE to enter, inclusive and easy to do. Welcome to our website. It features 530 artworks from 239 artists. 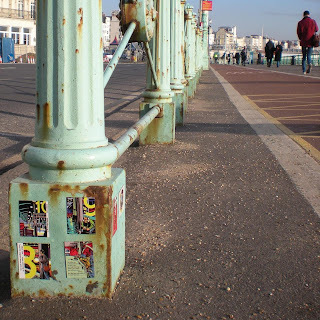 If you've just found a magnet in Brighton then you've come to the right place. Each magnet has number. Match that with the number on the online catalogue to the right and you've found your artist. If you want to find out more about the artist then the majority of them have a link on the artists page above. If you're thinking of coming along on Saturday 7th May. Then I'll be there with Dean Reddick, Peter S Smith, Stuart Simler, Jane Denman, Bryan Benge, Stephanie Wilkinson, Bill Mudge and many more. We'll be placing the magnets from 9.30am onwards, taking photos etc. Then inviting the public to pick one up from 10am onwards. We're going to stagger placing them too. 300+ at 10am, 100 at 11am and the final batch at noon. We may have to adapt to the arrival of the Children Parade at some point. Please drop by, say hello and pick up your favourite artwork for FREE. ps. I've got my eye on Number 393 by Ted Macrorie. BBC South East Today have had to cancel our filming. 'Due to the elections and the just gone Royal Wedding'. Sorry to anyone who had arranged to come down and help out. See you on Saturday 7th. On Wednesday 4th May at 9.30am I'm meeting a crew from BBC South East Today at the Pier to film a short piece about our magnet exhibition. If you'd like to come down then I'd really appreciate the support. Bring your magnet with you so we can try and include it on the TV. If you havent got my mobile number then drop me an email and I'll pass it on, then I can tell you of any last minute changes. Everything ready for Saturday 7th. Dean's cut the magnets. Please come along and say hello, place some magnets on bollards and get your photo on the website, like Jane Denman's Sky Blue artists (above). On the saturday we may have to be flexible because of the childrens parade but i'll try and keep you informed with any changes. 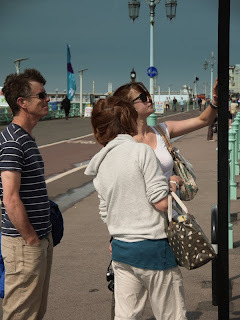 If in doubt, someone will be around with a Brighton Open t-shirt on, so just ask. Thanks for all your entries to Brighton Open. I'll finish getting images and links on the website in the next couple of weeks and then your magnets will be coming in the post. Unless you've contacted me to reserve a place then unfortunately We have closed submissions. If you've just missed out and want to have a go next time then drop me an email and I'll put you on our mailing list. They'll be a new adventure coming up! for information about the show. 450 places have now been filled. 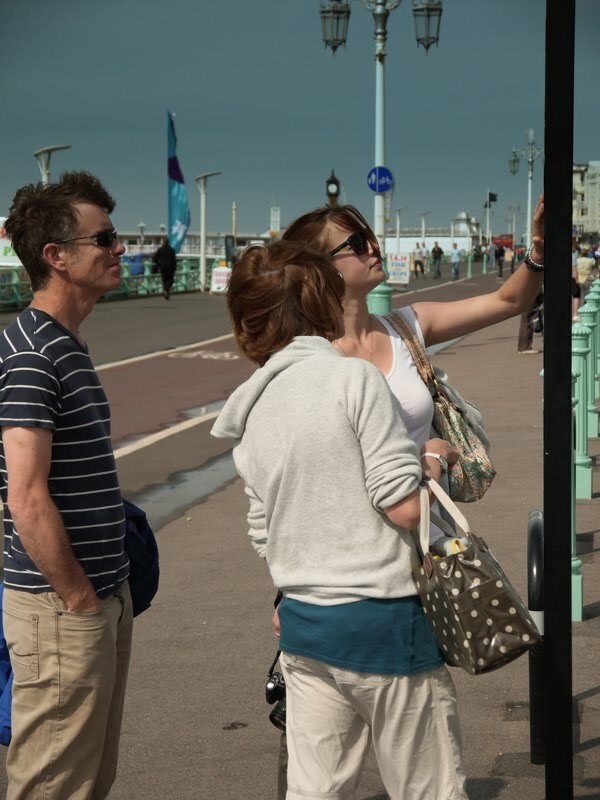 Only 50 spaces left if you're thinking of entering your image into the Brighton Open exhibition. View the Submit Work page above to find all the details of how to do it. Left is one of Peter S Smith's excellent black and white entries. 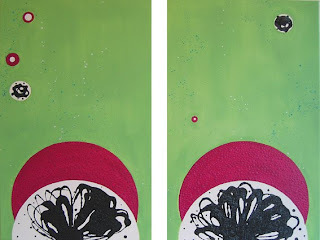 Find his and many other websites on the Artists page. The deadline for submissions is 1st April but we'll close before then., as we operate a 'first come first served' system. Left is our 250th entry so far, from the excellent Michelle Abbott. If you would like to enter work into the Brighton Open exhibition, view the submit work page above. Deadline is 1st April or earlier if we fill all the 500 spaces. We operate a first-come first-served system. We've recieved our permit from Brighton Council and will be exhibiting the magnets on bollards and railings along the Brighton seafront on the 7th May 2011. The public will be free to view the work, and if they like one, pick it up and take it home. 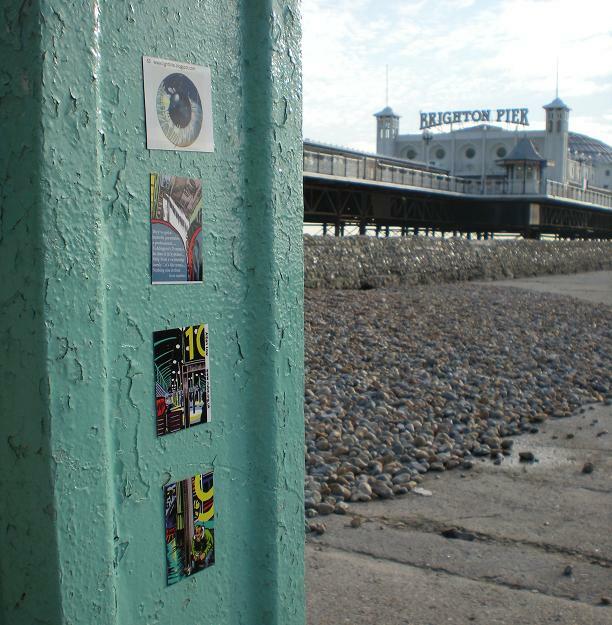 If you've found one of our magnets in Brighton click HERE to find out who created it, or view the slideshow below. Is an exhibition of Modern Magnetic Miniatures. Free to enter. All levels and skills accepted. Showing everywhere from galleries to the urban streets. So get involved.